The process of Lithography was invented at the end of the 18 th century in Austria . It has come a long way since then and is now used on a host of applications even for creating electronic devices some few nanometres in size. The element of Lithographic printing that we are concerned with is large Format. Here an image size of approximately 1.8 x 2.5 metres can be printed onto substrates that can be over a millimetre thick and made of paper/board and various plastics. Traditionally this application would have been satisfied by printing onto a thin sheet and then laminated onto a heavier board. Still very much in use some of the larger companies are using equipment that will print directly onto thicker substrate. The recent adoption of UV Curing inks for this process has taken it into areas where ink adhesion and resistance to chemical attack and abrasion resistance are important. These are generally in the point of sale sector where high quality images have to be viewed from a short distance and the quantities are such as to justify the considerable capital costs and complexity of the equipment. Computer to Plate systems and automatic registration can allow remarkably short nuns to be printed. The market is demanding high quality images at the lower prices possible with litho printing. If that is what the customer wants that is what they get. The effect of this is to blur the division between Litho, digital and screen printing when it comes to process selection. As companies spend the millions of pounds on equipment the tendency is to utilise it. However these large format litho machines are so fast and have a voracious appetite for print. Up to 9000 sheets per hour. As a printer you have to be able to manage such performance and provide sufficient work to justify the investment. 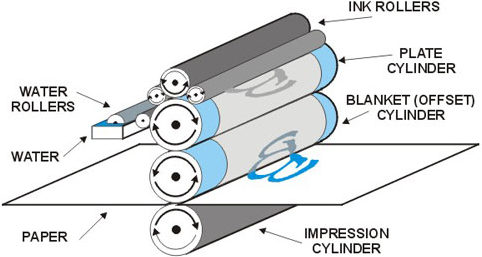 Accepting all this the lithographic printing process produces excellent results and the basic process has remained very similar over the centuries working on the surface characteristic differences of ink and fount solution. The two are designed to repel each other and the ink is attracted to the image area of the plate. 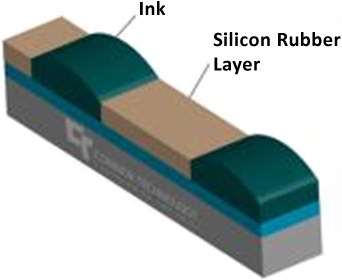 With all printing processes the relationships between the respective surface tensions of the liquids and surface energies of the image carrier (litho plate) and the substrate are the true mechanisms of how printing occurs. In conventional Litho. Printing the ink is oil based and the water that repels it contains chemicals that turn it into what we know as a fount solution. There is an alternative that is �Waterless Litho� where the non image area of the plate is silicone rubber that repels the ink. The system uses ultra violet curing ink and is very successful as long as the temperature of the system is carefully controlled and the ink rheology remains constant. A typical example of a company who uses litho. printing, screen printing, flexo and digital printing in its process offering is the POP specialist Kolorcraft of Ossett in the UK who installed a six-colour KBA Rapida 162a with coater to improve productivity and turnaround times and broaden its product offering. Kolorcraft's 162a is equipped with ST UV IR/hot air drying system and optimised hot-air knives allow coatings to be dried with the maximum possible air volume and no reduction in production speed. The use of twin-tube carbon lamps cut energy consumption and heat impact on the substrate during IR radiation. KBA along with companies such as Manroland have recognised the need for these very sophisticated large format machines. And the Point of Sale industry has taken them on enthusiastically. 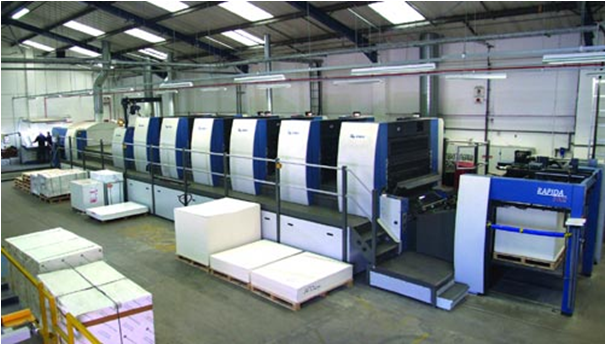 When using such high end offset litho equipment the provision of CTP is essential. This system is produced by several manufacturers such as Heidelberg but the specialist is Luescher AG. One of their units is the XPose! UV. T hese CTP systems use blue laser diodes for high-performance setting. The unit will take many different manufacturers plates up to the largest sizes. 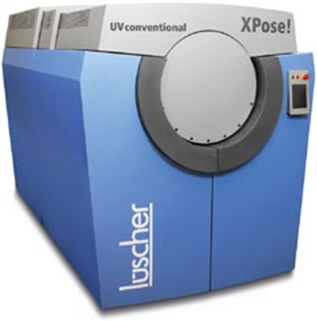 Their sophistication can only be understood by visiting the Luescher.com website and then talking to their experts. CTP has transformed this printing market with high speed production of plates to extraordinary quality levels. Going away from these hugely sophisticated machines there are still some companies who will use a litho proofing press for volumes up to a couple of hundred with remarkable results. Equipment that could look well in a museum still produces excellent quality.